Gallia Academy junior Josh Faro prepares to release a pitch during a Division II Southeast District semifinal against Hillsboro on May 14 at Rannow Field in The Plains, Ohio. Gallia Academy junior Josh Faro was the Ohio Valley Publishing area’s lone selection to the 2018 Ohio High School Baseball Coaches Association all-state baseball squads, as voted on by member coaches in the Buckeye State. 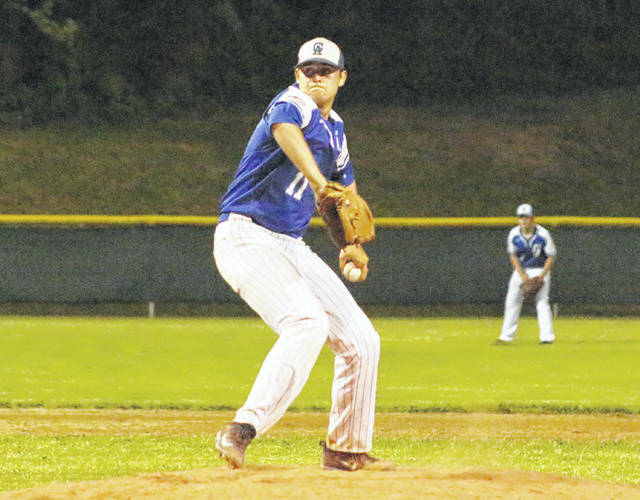 Faro, the ace starter for the 12-12 Blue Devils this spring, posted a 9-1 overall mark with a 1.13 ERA and 108 strikeouts while walking only 17 hitters. Faro’s lone setback came in eight innings at the Division II district semifinal as Hillsboro won 1-0. The southpaw was named to the Division II second team. Faro — an all-district and All-OVC first team honoree this season — is a first-time recipient of All-Ohio accolades in baseball. Eastern, Southern, River Valley, Meigs and South Gallia did not have player chosen in their respective divisions. PITCHERS: Joel Roediger, Wapakoneta; Zach Losey, Tipp City Tippecanoe; Mack Anglin, Sparta Highland. CATCHERS: Nate Miller, Bryan; Emma Lopez, Alliance. FIRST BASE: Isaac Beam, Chillicothe Zane Trace; Spencer Woolley, Canfield. INFIELD: Avery Fisher, Ontario; Bryce Ray, Bellevue; Preston Eisnaugle, Plain City Jonathan Alder; Logan Tonkovich, Cadiz Harrison Central; Quinton Roach, Kenton Ridge. OUTFIELD: Joey Velazquez, Cols. St. Francis DeSales; Don Goodes, Wapakoneta; Dominic Pilolli, Canfield; Brady Emerson, New Concord John Glenn. UTILITY: Alex Brill, Oberlin Firelands. Joey Velazquez, Cols. St. Francis DeSales. PITCHERS: Paul Szalay, New Concord John Glenn; Josh Faro, Gallia Academy; Greg Gilbert, Cols. St. Francis DeSales. CATCHERS: Cole Andrews, Cols. Bishop Watterson; Colin Ransom, Overlin Firelands. FIRST BASE: Luke Rawlins, Cols. Bishop Hartley. INFIELD: Stephen Krause, Wilmington; Kyle Zaluski, Chagrin Falls; Phillip Glasser, Tallmadge; Dalton Burcher, Indian Valley. OUTFIELD: Bryce Zuppe, Louisville; Alec Taylor, Steubenville; Jack Amendola, Chagrin Falls; Nate Stone, Granville. UTILITY: Harley Patterson, Chillicothe Unioto; Manny Vorhees, Wapakoneta. Brant Alazaus, West Branch; Drew Batson, Wash. CH Miami Trace; Jared Burick, Tallmadge; Cory Burroughs, Canal Fulton Northwest; Andrew Clelland, Cadiz Harrison Central; Seth Gergely, Tallmadge; A.J. King, Cin. Indian Hill; Evan Lacey, Oberlin Firelands; Cole Newbauer, Chagrin Falls; Logan Smith, Plain City Jonathan Alder; Ben Vore, Lexington; Brady Wallace, Wash. CH Miami Trace. PITCHERS: Jack Laird, Elyria Catholic; Andrew Russell, Champion; Caden Cooper, Milan Edison. CATCHERS: Mike Zeuli, Kirtland; Cameron Svada, Madison. FIRST BASE: Cole Dyer, Wheelersburg. INFIELD: Joey Torok, Kirtland; Andrew Miller, Berlin Hiland; Dylan Polen, Loudonville; Jacob Wenning, Coldwater; Dante Tucci, Sandy Valley. OUTFIELD: Leighton Banjoff, Elyria Catholic; Jay Luikart, Hillsdale; Dylan Hand, Northeastern; Trey Smith, Cin. Country Day. UTILITY: Trey Williams, Hillsdale; Aidan Endsley, Anna. PITCHERS: Cade Brintlinger, West Jefferson; Drake Batcho, Champion; Nick Thwaits, Ft. Recovery. CATCHERS: Bryant Lung, North Adams; Thayne Ocel, Rootstown. FIRST BASE: Shane Gray, West Jefferson. INFIELD: Reid Davis, Middletown Madison; Peyton Lane, National Trail; Jake Pickerel, Eastwood; Logan Fisher, Loudonville. OUTFIELD: Connor Pack, Fairbanks; Jake Moore, Carlisle; Ryan Hershberger, Berlin Hiland; Jake Boyd, West Jefferson. UTILITY: Connor Galloway, Piketon; Brenden Hershberger, Crestwood. Cade Bocs, Eastwood; Manny Camacho, Waynedale; Trey Carter, Wheelersburg; Noah Edwards, Genoa; Jared Eichelberger, Sandy Valley; Tristan Haught, Richmond Edison; Garrett Hurd, Portsmouth West; Casey Jones, Brookville; Darius Jordan, Minford; Macky McDonald, Paint Valley; Chris Reilly, Beachwood; Bryce Roberts, Milan Edison; Doug Shaffer, South Point; Connor Shields, West Jefferson; Tristan Sipple, Madison; Fred Sisco, Gibsonburg; Wyatt Smith, Wynford; Caleb Stone, Wynford; Ryan Strittmather, Elyria Catholic; Ryan Weaver, Waynedale; Tyler York, Newark Catholic. PITCHERS: Trey Bame, Carey; Owen Recker, Kalida; Wes Earles, Southeastern. CATCHERS: Zach Hawkins, St. Thomas Aquinas; Alex Alger, Dalton. FIRST BASE: Zach Kreais, Hopewell-Loudon. INFIELD: Luke Vonderhaar, New Bremen; Nate Karaffa, Toronto; Traeten Hamilton, Whiteoak; Zach Saffell, Fisher Catholic. OUTFIELD: Jared Huelsman, Minster; Nolan Clegg, Toronto; Caleb West, Whiteoak; Alec Zoeller, New Reigel; Ryan Luttmer, St. Henry. PITCHERS: Bo Smith, Seneca East; Evan Brill, Whiteoak; Sebastian Lay, Jackson-Milton. CATCHERS: Trevor McGraw, Wellington; Collin Overholt, Lincolnview. FIRST BASE: Bryce Kennedy, Sidney Lehman Catholic. INFIELD: Chayten Overholt, Lincolnview; Chase Carraher, Whiteoak; Logan Adams, Belpre; Grant Vera, Calvert Catholic; Jacob Webb, Seneca East. OUTFIELD: Jackson Goulter, Centerburg; Justin Stropky, Strasburg-Franklin; Ryan Bertke, New Bremen; Kurt Maxwell, Norwalk St. Paul; Levi Godwin, DeGraff Riverside. Ian Ashby, Lake Ridge Academy; Seth Bailey, Plymouth; Caden Brown, Ayersville; Luke Carper, Norwalk St. Paul; Josh Dentinger, Buckeye Central; Jacob Greer, Hicksville; Jay Knapke, St. Henry; Rickie Lacy, Seneca East; Daylon Lange, St. Henry; Alex Lehmkuhl, Minster; Mason Lehr, Whiteoak; Jack Nash, Rosecrans; Mitch Niedenthal, Strasburg-Franklin; Jake Roach, Lake Ridge Academy; Easton Roark, Carey; Gavin Robbins, Grove City Christian; Nick Sninchak, Toronto; Cameron Summers, Lisbon Anderson; Brayden Wentling, Carey.